BERLIN, 5 July, 2017: Atotech introduces BondFilm® LDD and BondFilm® LDD Enhancer, its latest additions to the BondFilm® product family, the world’s most successful, reliable and omnipresent oxide replacement process for inner layer bonding and LDD pretreatment. 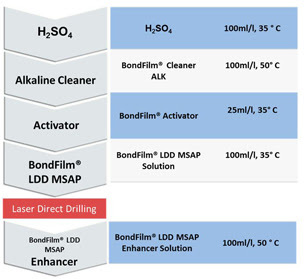 Together with the non-etching post-treatment BondFilm® LDD MSAP Enhancer, which prepares the surface for subsequent process steps, it is the perfect combination to optimize the operation of mass production CO2 lasers in an environment for mSAP applications. BondFilm® solutions for LDD pretreatment have been on the market for several years now. Changing market needs, however, have led to a need to significantly reduce the etch depth of the LDD pretreatment process and to introduce a non-etching post-dip which removes all organic residues from the surface. Atotech’s new BondFilm® LDD and BondFilm® LDD Enhancer meet these new requirements. The process offers uniform roughness and surface characteristics for improved efficiency of laser absorption and reaches a target etch depth of 0.5 µm, while the enhancer does not etch the treated surface at all.